Pneumatic cylinders are used in almost every phase of the manufacturing process and manufacturers know the importance of pairing their pneumatic cylinders with reliable, high quality, position sensing magnetic proximity switches. Canfield Connector’s magnetic proximity sensors offer superior reliability through unmatched quality, all while proving to be more cost-effective. Canfield Connector’s proximity sensors are manufactured to meet your requirements by offering thousands of customization options such as Reed or Hall Effect sensing functions, LED Lighting, surge suppression, standard operating voltages, and many more. Among Canfield’s comprehensive line of magnetic proximity sensors, the Series 7000, 7C, 7GL, & 7HL are used to sense position on tie-rod pneumatic actuators and have been designed to easily mount to 2” to 8” bore, tie-rod pneumatic actuators. 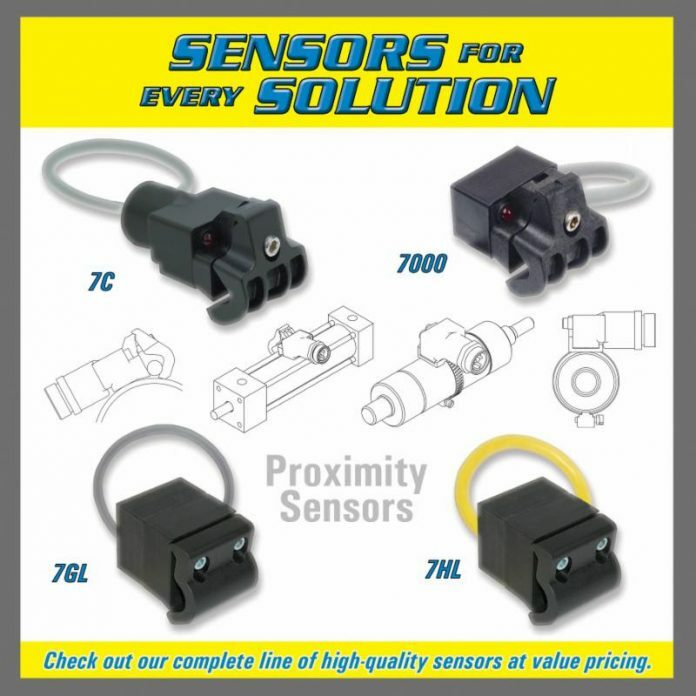 We’ve designed and manufactured our tie-rod proximity sensors to meet IP67 / NEMA 6 environmental protection ratings as well as General and Hazardous locations by offering CSA Class/Division ratings. Visit our website to see Canfield’s complete line of cylinder proximity sensors which include many groove mount proximity sensors, threaded magnetic sensors inclinometers, and more. Canfield Connector was founded in 1977 in a garage in Canfield, Ohio reselling German solenoid air valves to Volkswagen. In 1980 we introduced the first DIN 43650 style solenoid valve operator, as well as mating solenoid valve connectors to the North American solenoid valve market Lighted solenoid valve connectors soon followed in 1981. By the mid 80’s, the Canfield brand had become synonymous with German quality product coupled with US innovation. Soon, we began manufacturing DIN 43650 connectors, timers, proportional solenoid drivers, and air cylinder position sensors. Product development marched on as we invented the first solid state inertial breaking system designed for Recreational Vehicle tow vehicles, Electronic timers for oxygen concentrators, electronics for valves used in the M1-A1 Abrahms Tank, media separated valves for home kidney dialysis, controls for air-dryers, flow/pressure/temperature all-in one sensors, as well as many other specific applications. With the new millennium, we had moved into our new 40,000 sq. ft. facility where we began molding our own plastic parts, developed our own surface mount electronics production line, perform laser welding, machining and assembling all in Boardman, Ohio. In 2005 we changed our culture and earned an ISO 2001:2008 with Design certification for quality. We were the first in the solenoid valve industry to create a virtually indestructible all molded DIN 43650 connector that is copied but never replaced. The company holds many patents for innovation. Today our modern facility makes products that integrate IOT (Internet of Things) for Industry 4.0. Other products include linear actuator sensors, round style sensors, inclinometers, tilt switches, M12 and GT Series (Deutsch Style) mobile connectors, conveyor controls, Can Bus controls, special machine controls as well as time delay relays. With over 100 associates Canfield Connector stands ready to take on your next big innovation and help you bring it to reality. For more information, visit www.canfieldconnector.com or contact customerservice@canfieldconnector.com.